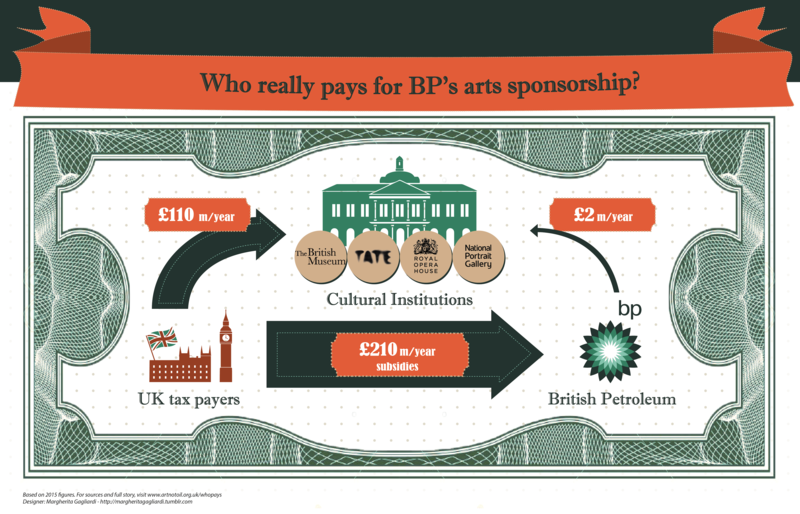 Who really pays for BP's arts sponsorship? In recent years, Art Not Oil and others have been shifting the debate around oil sponsorship, using creative actions and in-depth investigations to build the case against BP’s sponsorship of the arts. And today we’re launching a bold new infographic alongside Oil Change International, exposing the truth about who really pays for BP’s arts sponsorships – the taxpayer. BP is desperate to paint a picture of itself as a generous donor to the arts, helping out in a time of budget cuts. But in reality it is soaking up millions of pounds of taxpayers’ money and then asking the public to be grateful for the loose change it gives back as sponsorship. 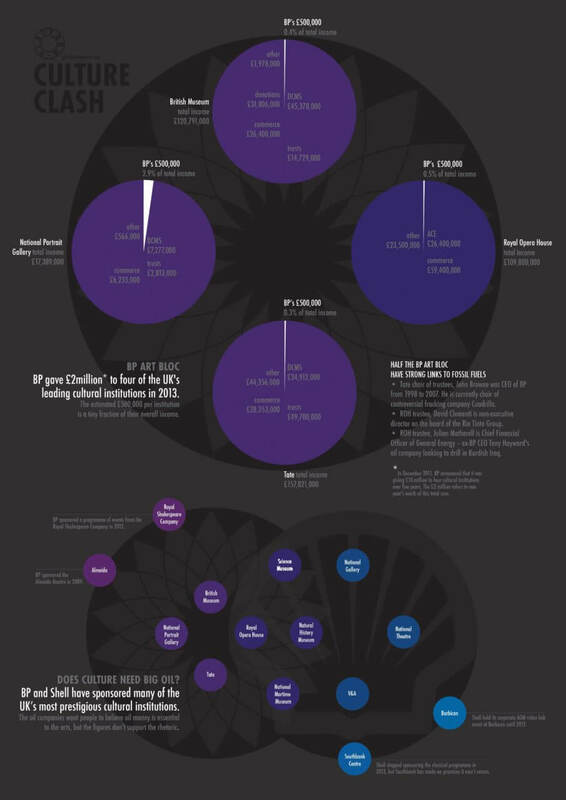 At the same time, taxpayers’ contributions to the arts continue to massively outweigh any of BP’s payments. This was the huge amount of taxpayers’ cash that BP soaked up in a generous tax subsidy from the UK government in just one year. But with other tax breaks, the true amount that BP made at the taxpayers’ expense over 2015 could be even higher. Meanwhile, oil subsidies are continuing to increase. Former Chancellor George Osborne’s last two Budgets in 2015 and 2016 transferred billions of government funds to the industry. Not only did his successor Philip Hammond decline to reverse the handouts, he has started a review of whether they should go further. But in the same year, BP shared out just £2 million in arts sponsorship between four cultural institutions – the Tate, the British Museum, the Royal Opera House and the National Portrait Gallery – as part of a 5-year deal. In return, these iconic museums and galleries allowed BP to brand exhibitions and host private events, helping to boost the company’s brand and allowing BP to schmooze policy-makers. And for Tate, the British Museum and the Royal Opera House, BP’s payments represented around just 0.5% of their budgets. While BP was flaunting its arts sponsorship in 2015, the same four institutions collectively received around £110 million of taxpayers’ money through grants from the UK government – more than fifty times the size of BP’s payment. And when BP announced last July that it would be ending its sponsorship of Tate after 26-years, it weakly claimed that its decision was down to a “challenging business environment”. But these stats tell a very different story. For the UK government to subsidise fossil fuels while the planet warms but make cuts to the arts sector when it boosts the economy makes little sense. Meanwhile, BP is taking full advantage of the situation in order to boost its profits and its brand. And now there’s a new BP sponsorship deal in the pipeline – but cut by a quarter – and with the Royal Shakespeare Company taking Tate’s place. But we’re not going anywhere. We’ll be exposing BP’s cheap advertising for what it is and creatively calling on these iconic arts institutions to cut their ties to fossil fuels. - In December 2011, BP announced a 5-year sponsorship deal for £10 million divided between the four cultural institutions.